Peter Handcock was born near Peel, New South Wales in 1868. His father died when he was aged 6 so he had a minimal education and was apprenticed to a blacksmith at age 12. Peter was the second youngest of eight surviving children of William and Bridget Handcock. William was a farmer and carrier and he also operated two thrashing machines in partnership with George Fish, owner of the foundry in Bathurst where Peter was later apprenticed as a blacksmith. Peter was working as a labourer in Dubbo when he married Bridget Martin (1871-1944) in Bathurst in 1888. They had 3 children, William (1889-1941), Peter (1891-1966) and Eileen (1894-1944). This photo was taken in 1896. 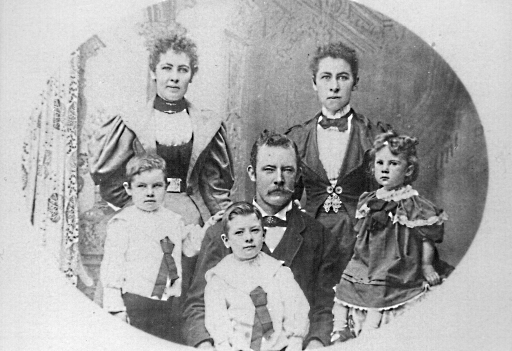 It shows Bridget(left) and her twin sister Ellen standing behind from left William, Peter nursing son Peter, and Eileen. Photo courtesy Joyce O'Farrell, with many thanks. “Bridget could not walk the streets of Bathurst as the townspeople shunned her, threw stones and called her names. It was many years before Bridget and her young family could peacefully walk the streets of Bathurst” “Further Than The Eye Can See”, Eileen Joyce O’Farrell, p52, ISBN 978-0-646—93222-4, record of an interview in 1986 with Elizabeth Mae Bowan (nee Clines), daughter of Bridget Handcock by her 2nd marriage to Maurice Clines. This treatment must have had a devastating effect on his young children and I know my grandfather, Peter, spent the rest of his life defending his father's good name. Along with other family members he campaigned to have Peter Handcock's name added to the Bathurst Boer War Memorial and he was finally rewarded when the good people of Bathurst agreed to do so in 1964. 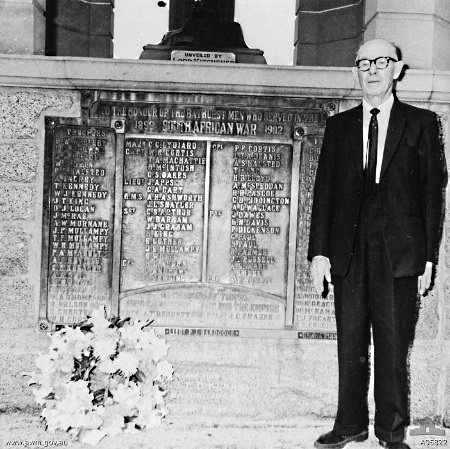 My grandfather pictured at Bathurst when his father's name was added to the memorial. Sadly, the young boy on his dad's knee in the picture above would spend the rest of his life deprived of the father who was nursing him. I recall how proud he was to be invited to the ceremony and I'm glad he lived long enough to witness this event. At the expiry of his enlistment Major Lenehan offered him a commission in the Bushveldt Carbineers which he accepted with effect from 21 February 1901. While the BVC was a locally formed unit it should not be forgotten that Peter Handcock went to South Africa as the member of an Australian unit and served honourably in that contingent for twelve months. In the above-mentioned newspaper interview Bridget Handcock said that he wrote to her saying that "he had got a promotion and intended to remain in South Africa as it was no use to return to New South Wales as there was so little work, and further he loved a soldier’s life". She went on to say that she had received many letters from him, the last being about three months ago. On the same page Kit Denton went on to say about Peter Handcock “There is no record of any word being spoken against him in his civilian life and nothing adverse in his time as a soldier – until after his arrest”. The following letter is particularly important. As military chaplain Rev. Brough would have been the confidant of many of the members of the Pietersburg garrison and so would have a fairly strong understanding of the character and personalities of all those involved in the courts-martial. “Dear Madam,--I was military chaplain at Pietersburg, in the Northern Transvaal, during all the time that the Bushveldt Carbineers had their headquarters there, and I knew your late husband and all those officers and men who were concerned, for and against, in his trial, and I attended most of the sittings of the courts. And, knowing what I know, I want to say to you that, great as may be your grief for the loss of him, you need feel no shame, but rather pride, on his account. He was a good-hearted man, and a brave soldier, simple and fearless, and he did what he was told. If he did wrong-I do not say that he did-it was the fault of his superiors, and [sic] gave him their orders. In the matter of the shooting of the Boer prisoners, of which he and others were found guilty, he acted under the orders of Lieutenant Morant, a man of strong feelings and eager to avenge the savage murder of his friend Captain Hunt. In the matter of the shooting of the missionary, the only one of the crimes charged which really excited any moral indignation, the court, without hesitation, found him not guilty, and never, I should think, has a feebler charge been brought before a court. I believe that Rev. Brough’s letter is highly significant for a number of reasons so I intend to discuss it further in another post. “…But the matter of Vet. Lt. Handcock wants special elucidation – especially in view of the lying and filthy statements made in some of the English newspapers, and which find ready sale here. It’s a shame that those involved with the preservation of our military history are unable to do so with impartiality. Surely it is incumbent on them to present all the known facts and allow people to draw their own conclusions. **Judicial murder is the unjustified use of capital punishment. The court consider both were influenced by Lieut. Morant's orders, and thought they were doing their duty in obeying them. Their good services throughout the war. I have Barry Caligari's paper to thank for this information, I certainly didn't learn about it from any historian I've read. So when Kitchener ignored the law and carried out Peter Handcock's death sentence he was guilty of judicial murder in addition to all his other war crimes. Kitchener knew he was acting unlawfully. He only informed the Australian government of the executions by cable on 5 April 1902, five weeks after they were carried out, and then only after he was asked to do so by the Australian government. Many writers have commented on the lies and distortions in that cable where he claimed, for example, there were no extenuating circumstances and that "Morant was originator of crimes, which Handcock carried out in a cold blooded manner". When he eventually sent the courts-martial findings to the Australian government he failed to include the mercy recommendations, which clearly indicate Peter Handcock's subordinate role in the shootings. Despite the understandable animosity that has prevailed in the Northern Transvaal, the people there have not been taken in by Kitchener's duplicity in scapegoating Peter Handcock for killings instigated by Kitchener and his cohorts. "The volatility of the occasion was heightened by the presence in the audience of descendants of the Boers who had been shot by the Carbineers: the spectators were not only biased but actively hostile. As the trial continued, the audience became more vocal and their partisanship hardened..." but is spite of this "In the end Naish succeeded, through an audience vote, in having Handcock found guilty on lesser charges and thus escaping the firing squad..."
Kelly, Vivienne. 2009. 'Ghosts of the past: Breaker Morant and re-enactment'. History Australia 6 (1):pp.8.1 to 8.14. Kitchener seems like the murderer here, killing two men to maintain his reputation and hide his policies. Thank you for your comment. You're right, Kitchener was the real villain and I hope that some day history will judge him as such. You have honoured your great-grandfather's memory with this blog. Excellent work! Thank you. I am very grateful to you and the thousands of others who have taken the time to read my blog. Thank you Klaus. I am sorry about the delay in responding to your comments. I look forward to hearing about your revised book. Thank you. I am greatly encouraged by your kind remarks.